After speaking about an old self-filler by Sailor, it might be time to speak about the origins of the new, contemporary, self-filling fountain pens of this company. Between the old bulb-fillers from the 1950s and the first Sailor Realo (2006), about 50 years of boring and clean and efficient cartridges and converters have passed. 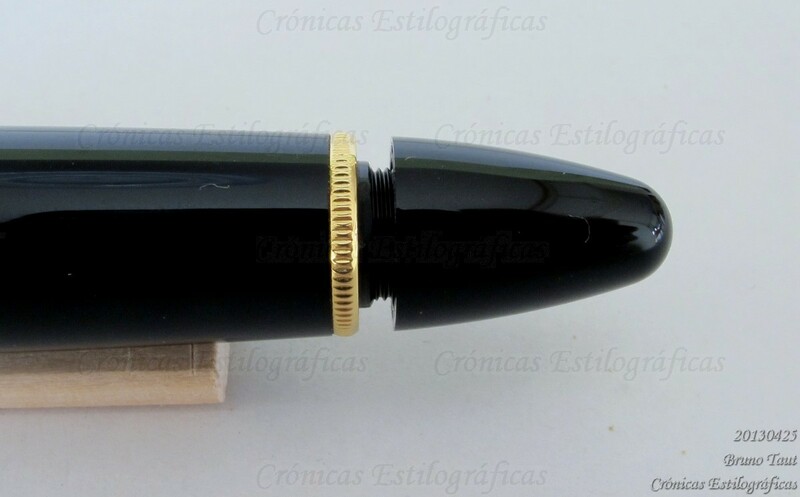 Then, to celebrate the 95th anniversary of the company in 2006, Sailor marketed a big piston filler based on the King of Pen line in the Profit (1911 in some markets) style of balance pens. And this was the first piston ever made by Sailor. 500 units were made for Japan, and 100 more for overseas markets. Most of them were black, but there seems to have been a small number units in maroon, and an even smaller number with maki-e decoration for Singapore (as reported by A. Lambrou and M. Sunami; Fountain Pens of Japan. Andreas Lambrou Publishers 2012. ISBN: 978-0-9571230-0-2). Speaking for myself, I have only seen black units. The inkwell shown on the picture is not the original one. It had the Sailor logo on the lid. The package includes a pen pouch made of deerskin leather coated with urushi, a traditional craft from Yamanashi prefecture. But should we remember that is only an accessory. The second element of interest, after the filling system, in this pen is the nib. It is a Naginata Togi in M partially rhodiated. 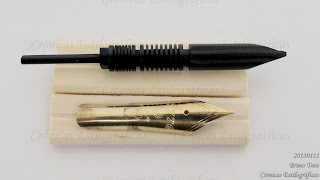 This is exceptional because Naginata nibs come usually in the big size (in Sailor terms, opposed to medium and super big sizes), and this meant that Sailor made a special casting of this nib for the commemorative pen. 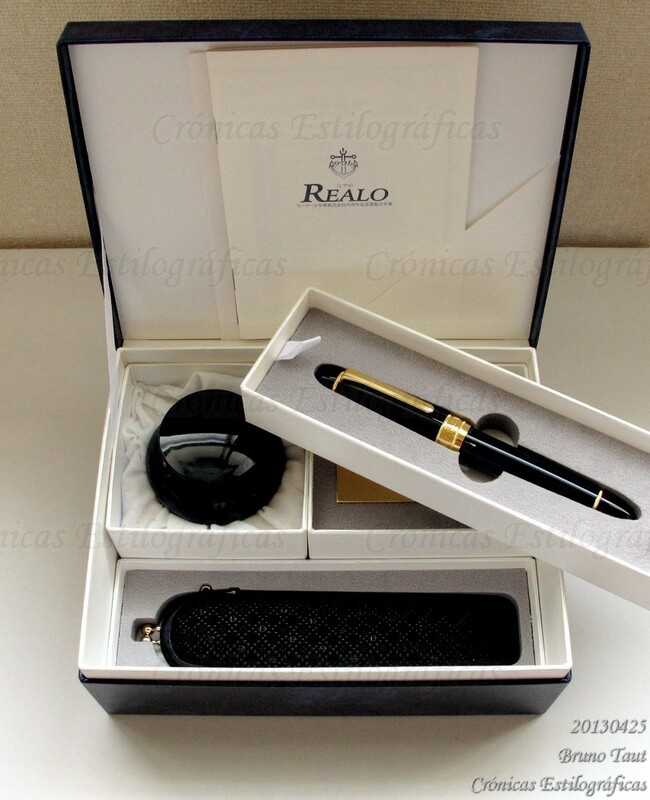 The cap is subtlely engraved: "REALO 2006 / (serial number)/500". This pen is one of the 500 units made for Japan. Those for overseas markets were numbered over 100. The final result is a pen with two elements many stylophiles love—an exciting nib and a non-trivial filling system—making this one of the most interesting commemorative pens ever made by Sailor. Should it have been more exotic with the looks, it would have been almost perfect. And that might be the case of those Sailor Realo with maki-e made for the Singaporean market. However, cheap might be not, and that in the case you found one. 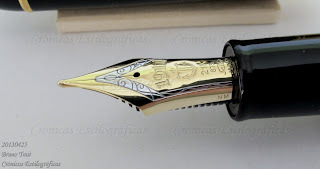 The super big, in Sailor terms, nib made of 21 K gold. 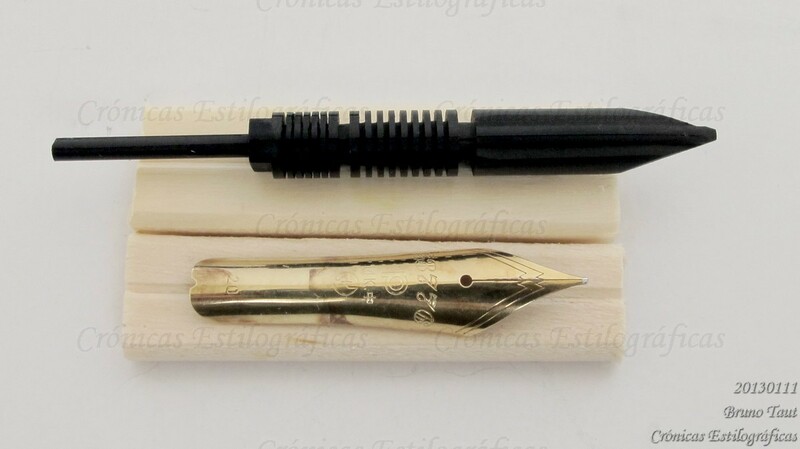 It is a Naginata Togi nib in M.
The original price of the Sailor Realo in Japan was JPY 80000, plus tax. 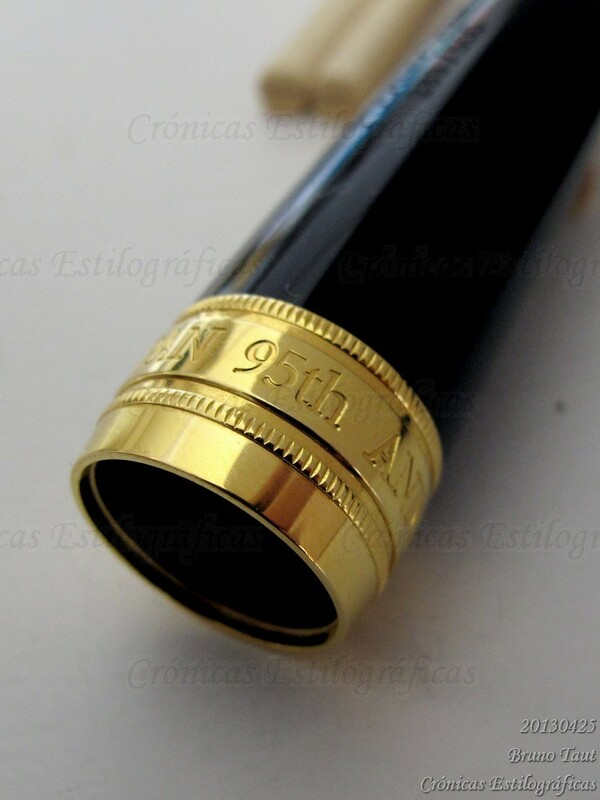 The wide cap ring carries the following inscription: "SAILOR JAPAN 95th ANNIVERSARY". Detail of the decorative ring between the barrel and the culotte. But this was a limited edition and only 600 units went into the market. Sailor, however, followed up in 2009 with a more affordable, and smaller, piston filler based on senior size of both the balance Profit/1911 and of the flat top Professional Gear models. 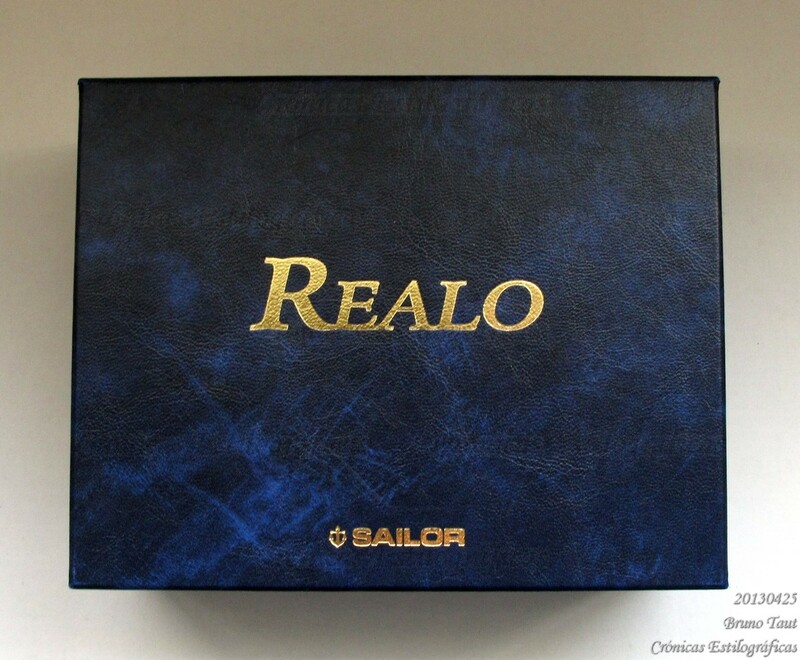 The basic price of these smaller Realos is JPY 30000, plus tax, and that implies sticking to the usual triad of points—F, M and B. Upgrades to more complex nibs are available during Sailor sale events and at some Sailor Friendly Shops. They are not cheap. The picture shows the original Realo from 2006, on top, and the regular model, not limited, from 2009, on bottom. The later is a much smaller pen, based on the senior size of the Profit/1911 or the Professional Gear series of pens. That is one awesome pen. Maybe one day Sailor will bring back this pen, or something similar. A piston filling KOP would be very nice. I'm not so much tempted by the new realo, it's nice but just an integrated converter.... in that case i'd rather have the convenience of the regular converter 1911. 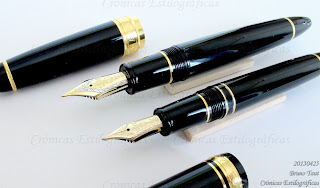 It would indeed be nice, but at the end what matters are the numbers--how expensive that pen would be to produce, how expensively Sailor could sell it. I think the number would work well, but Sailor seems to be more focussed on its wonderful nibs than on filling systems. Sailor, after all is not that big, and the fountain-pen business is rather limited regardless of what we die-hard aficionados might think. Thanks, MdM, for passing by and commenting.